Pro-net neutrality lobbyist Freepress has conducted a study on network investments in the Title II era coming to the conclusion net neutrality has not had any adverse effect. It’s an claim which has underpinned the argument of FCC Chairman Ajit Pai in his quest to erase net neutrality, but Freepass is calling bullsh*t on the idea net neutrality discourages investment in networks across the states and inhibits innovation. Now Freepass is an organization which is passionately pro-net neutrality, so it would be advisable to take claims with a pinch of salt. By looking through the investment numbers available from the publicly traded ISPs in the US, Freepass has pointed out network investments were up 5% in the two years net neutrality was in place compared to the two prior. 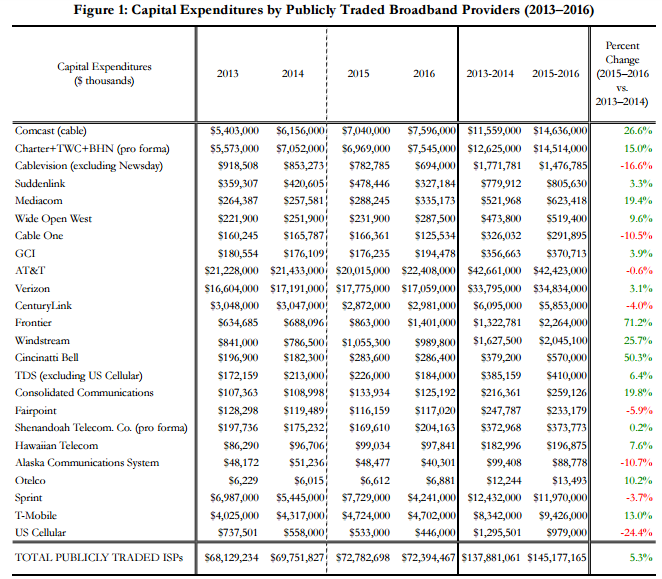 AT&T accounts for roughly a third of the spend across the period, and was in fact on of the ISPs which saw a decline in network investment, which Freepass claims is fuel for Pai’s argument. However, Freepass points out AT&T also told investors nearly a year after the FCC’s Open Internet vote that its capital investments had decreased due to the completion of those projects. The FCC vote might well have weighed in on decision making, but it doesn’t appear there were any great expenditures on the horizon anyway. What might be worth pointing out is that these commitments were most likely made prior to the two year period which Freepass is using as evidence that there is nothing wrong with net neutrality. Investments did increase through the 2015-16 period, though this spend was probably in the pipeline for ages. No ISP is going to halt this expenditure or these projects, which would have been earmarked as necessary, because of the introduction of net neutrality. It is certainly an interesting point made by Freepass, though the team has not taken into account the length of technology roadmaps. For any meaningful insight to be taken from the regulation it would be better to look at investments over the next three to five years. It removes any kneejerk reactions, though we doubt there were ever going to be any, and allows you to see what the ISPs reaction would be when net neutrality is factored into the long-term technology roadmap. So yes, Freepass has made an interesting point, but it is a moot one to be completely honest. Some might look at Freepass’ research and state it is a bit misleading. Figures like this can be interpreted in numerous ways, it is likely some will disagree with us as well, though Freepass seem to be taking the figures at face-value as opposed to taking to consideration business strategy. The guys in charge are not idiots, they don’t make things up as they go along, these investments would have been in place for some time. Freepass doesn’t seem to take this into account.